1. Soak rice in sufficient water for 30 minutes. 3. Heats clarified butter in a pan and add the garam masala. 4. Saute till it crackles. 5. Add the rice and fry till a pleasing aroma emanates. 6. Add 450 ml water and boil till three fourths cooked. 8. Soak saffron in warm milk. 9. In a pot, sprinkle some saffron mixture. 10. Spread a layer of rice and dry fruits, then add the remaining saffron mixture, rose water and fried onions. 11. Seal the pot with aluminum foil. 12. Cook on very low heat for 30 minutes. 13. Remove from heat and serve hot. 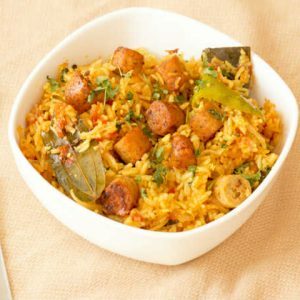 Feel free to comment or share your thoughts on this Pulao With Nuts Recipe from Awesome Cuisine.